Ande brings a range of experience in design, marketing, project management, content creation and communication to Frontline. She has worked in a variety of industries in both Canada and New Zealand, ranging from real estate to publishing to fine arts. Raised in the Gulf Islands, Ande moved to Vancouver to attend Emily Carr University where she graduated with a Bachelor of Communication Design. 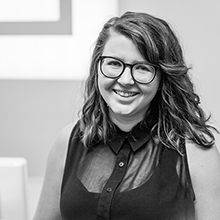 Ande combines her passion for design and marketing in her role at Frontline.